Avanti 50-Bottle Wine Cellar w/ Wood Trim (P/N WCR506SS). 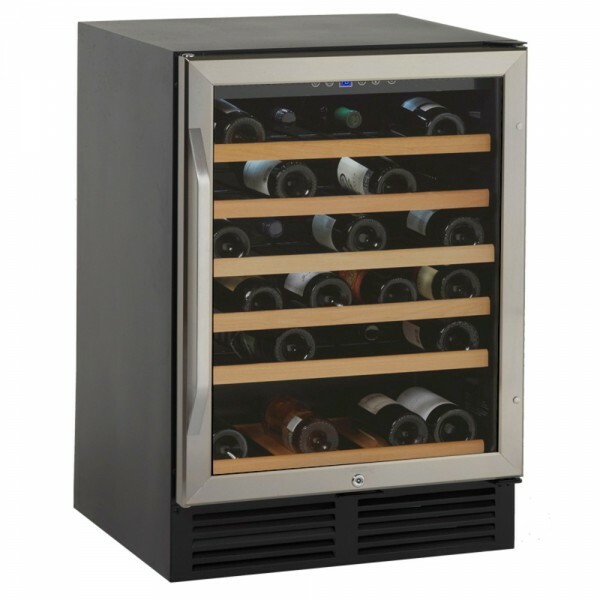 This mini cellar is designed to be free standing or built-in and features Stainless steel-glass trimmed doors and handle, LED readout for temperature setting and monitoring, and interior display lights. The vinyl coated roll-out shelves with wooden fronts allow for easy access to your wine collection. If installing as a built-in then you will need minimum spacing of 24" W x 26" D x 35" H. Please refer to instruction manual.